Anybody following the industry over the last decade will have heard of Arm. We best know the company for being the enabler and providing the architecture as well as CPU designs that power essentially all of today’s mobile devices. The last 7-5 years in particular we’ve seen meteoric advances in silicon performance of the mobile SoCs found in our smartphones and tablets. 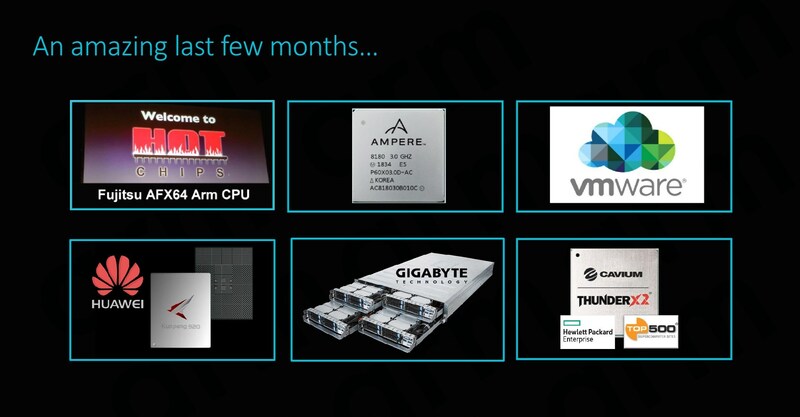 However Arm's ambition goes widely beyond just mobile and embedded devices. The market for compute in general is a lot larger than that, and looking at things in a business sense, high-end devices like servers and related infrastructure carry far greater profit margins. So for a successful CPU designer like Arm who is still on the rise, it's a very lucrative market to aim for, as current leader Intel can profess. To that end, while Arm has been wildly successful in mobile and embedded, anything requiring more performance has to date been out of reach or has come with significant drawbacks. Over the last decade we’ve heard of numerous prophecies how products based on the architecture will take the server and infrastructure market by storm “any moment now”. In the last couple of years in particular we’ve seen various vendors attempt to bring this goal to fruition: Unfortunately, the results of the first generation of products were less than successful, and as such, even though some did better than others, the Arm server ecosystem has seen a quite a bit of hardship in its first years. While Arm has been successful in mobile for quite some time, the overall performance of their designs has often left something to be desired. As a result, the company has been undertaking a new focus on performance that is spanning everything from mobile to servers. Working towards this goal, 2018 was an important year for Arm as the company had introduced its brand-new Cortex A76 microarchitecture design: Representing a clean-sheet endeavor, learning from the experience gained in previous generations, the company has put high hopes in the brand-new Austin-family of microarchitectures. In fact, Arm is so confident on its upcoming designs that the company has publicly shared its client compute CPU roadmap through 2020 and proclaiming it will take Intel head on in PC laptop space. While we’ll have to wait a bit longer for products such as the Snapdragon 8CX to come to market, we’ve already had our hands on the first mobile devices with the Cortex A76, and very much independently verified all of Arm’s performance and efficiency claims. And then of course, there's Neoverse, the star of today's Arm announcements. 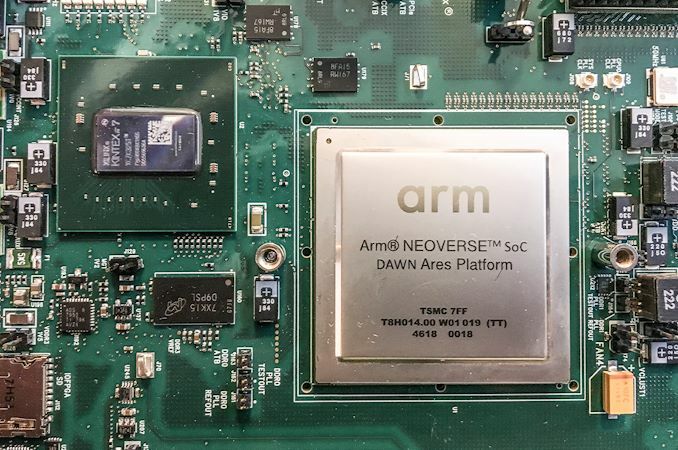 With Neoverse Arm is looking to do for servers and infrastructure what it's already doing for its mobile business, by greatly ramping up their performance and improving their competitiveness with a new generation of processor designs. We'll get into Neoverse in much deeper detail in a moment, but in context, it's one piece of a much larger effort for Arm. All of these new microarchitectures are important to Arm because they represent an inflection point in the market: Performance is now nearing that of the high-end players such as Intel and AMD, and Arm is confident in its ability to sustain significant annual improvements of 25-30% - vastly exceeding the rate at which the incumbent vendors are able to iterate. The last couple of months have been quite exciting for the Arm server ecosystem. At last year’s Hotchips we’ve covered Fujitsu’s session of their brand-new A64FX HPC (High performance compute) processor, representing not only the company shift from SPARC to ARMv8, but also delivering the first chip to implement the new SVE (Scalable Vector Extensions) addition to the Arm architecture. Cavium’s ThunderX2 saw some very impressive performance leaps, making its new processor among the first to be able to compete with Intel and AMD – with partners such as GIGABYTE offering whole server systems solutions based on the new SoC. Most recently, we saw Huawei unveiled their new Kunspeng 920 server chip promising to be the industry’s highest performing Arm server CPU. The big commonality between the above mentioned three products is the fact that each represents individual vendor’s efforts at implementing a custom microarchitecture based on an ARMv8 architectural license. This in fact begs the question: what are Arm’s own plans for the server and infrastructure market? Well for those following closely, today’s coverage of the new Neoverse line-up shouldn’t come as a complete surprise as the company had first announced the branding and road-map back in October. 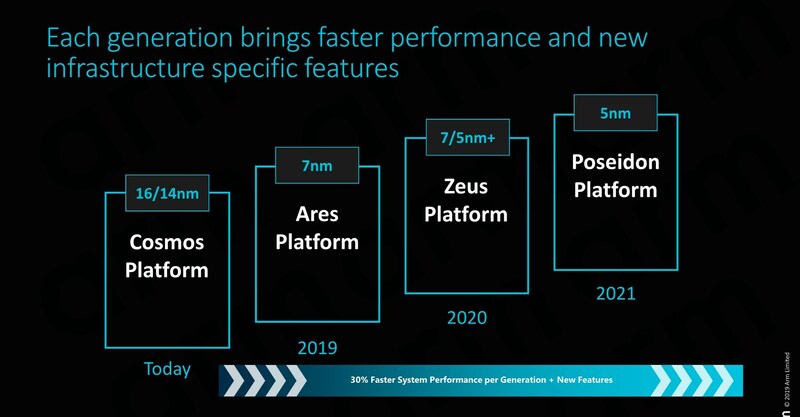 Particularly today’s announcement of the Neoverse N1 platform sheds light onto what Arm had teased back in the initial October release, detailing what exactly “Ares” is and how the server/infrastructure counter-part to the Cortex A76 µarchitecture will be bringing major performance boosts to the Arm infrastructure ecosystem.